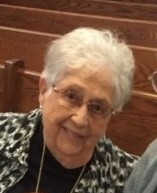 Gertrude “Gert” Michael, 92, passed softly into the arms of Jesus on January 14, 2019 at St. Vincent’s Mercy Hospital in Toledo, Ohio following a brief illness. Gert was born January 30, 1926 in Hillsdale County, Michigan, the daughter of Ellsworth and Ruth (Reynolds) Foster. Gert’s childhood was spent in her beloved hometown of Hillsdale, Michigan where she seldom missed attending the county fair. A graduate of Hillsdale High School, she loved music and theater and played string bass in her high school orchestra. In her adult years she kept meticulous records and addresses of her classmates and organized many class reunions. She was a telephone operator in Hillsdale when she met Mayroe “Barney” Michael, at his welcome home party when he returned from World War II. Barney proposed to Gert after knowing her only 29 days and they were united in marriage on July 19, 1946 at her parents’ home on Spring Street in Hillsdale. Following their marriage, they became lifelong residents of Montpelier, Ohio where they raised their family. She was a Western Union Telegraph operator, worked at Henry’s Shoe Store, Trautman’s 5 and dime store, and retired as an assembly operator at Robinair Manufacturing in Montpelier. An active member of the Montpelier community, she served on the Montpelier Tree Commission and was a member of the St. Paul’s United Methodist Church where she taught Sunday School and was a member of the Eve Circle Group. Additionally, she was a 65-year member of the Montpelier Order of Eastern Star, where she achieved Worthy Matron status, Mid-Century Study Club, the Montpelier Moose Lodge and Williams County Democrats. She loved to bowl, watch WWE wrestling on television and dearly loved to play euchre with family and friends, never wanting to miss playing cards with her card club group. Grandma “Bubbles” to her grandchildren, she will be missed for her genuine wit, intelligence, trivia knowledge, vivid memory and the ability to connect personally with people of all ages. She set up her own Facebook page at age 90 and spent countless hours surfing the internet and communicating with Facebook friends. She loved nothing better than entertaining friends on her front porch with lively conversations and coffee. She was a grandma that “never got old,” and could find humor and laughter in every situation. We will see you over the rainbow on your porch surrounded by everyone and everything you love. She is survived by her husband of 72 years, Barney; and children Tom (Barb) Michael of St. Louis, Missouri, Susan (Keith) Wiesehan of Antwerp, Ohio, Jeanne (Daryl) Caryer of Bryan, Ohio and Rebecca Robertson of Bryan, Ohio; brother Richard (Rachel) Foster of Zephryhills, Florida; twelve grandchildren, twenty-seven great grandchildren; special neighbors and family friends Michael and Tina DeLong. She was preceded in death by her parents Ellsworth and Ruth (Reynolds) Foster and sister Shirley Roberta Foster. Visitation for Gert will be on Thursday, January 17th from 3-8pm at the Thompson Funeral Home on Main Street in Montpelier. Services will be on Friday at 11am at St. Paul’s United Methodist Church in Montpelier. A graveside service will be held after the luncheon at 2:30pm at Lost Creek Cemetery in Hicksville, Ohio. Memorial contributions may be made to Montpelier Parks and Recreation Summer Lunch Program or the Helping Hands Pantry - Backpack program.